1. What morphs are you keeping? I work with Amels, Ghosts, Patternless, Whiteouts, Oreos, Zeros/Stingers, Granites, Caramels, and Zulus. I also am working with several new morphs and several unproven morphs, that should hit the market next year! I was never really a gecko person, or even a lizard person. I always have kept and bred snakes. My original group of 1.3 wild-caught animals were for my little brother because he wanted a lizard pet. Shortly after I purchased those animals, I went to work for a large Ball Python breeder and importer (the same company I purchased the Fat-Tails from). During my first couple of months there, I began researching the vast variety of Fattie morphs and the potential they had. After that, I was hooked, and my collection expanded exponentially. I keep my animals a little differently than most breeders. I house my adults in 6 quart Iris tubs. I keep my thermostats set at 91 Fahrenheit. I use Helix brand thermostats exclusively. I use newspaper as a substrate, as I find it much easier to sanitize than other substrates. It also makes daily maintenance easier. I provide all animals a 2 ounce, ceramic water dish. Every adult is provided with a humid hide, to ensure proper shedding and egg laying. Males and non-gravid females have damp paper towel in their hides. As soon as a female is bred, she gets a peat moss-vermiculite mix in her hide. I do this so that she has a suitable area to deposit her eggs. I feed adults lateralis cockroaches every day to every other day. I supplement with Rephashy Super Cal loD, and Super-Vite every feeding. I keep babies in pencil box racks which are available from Reptile Basics. I use paper towels as bedding. For a hide I use a piece of corrugated plastic piping cut in half. I don’t provide them a humid hide or a water dish, as they are sprayed daily. I feed them once or twice every day. 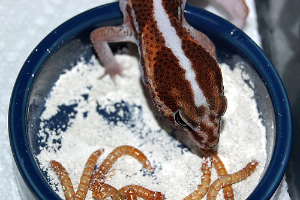 I feed them lateralis roaches as well, using the same supplementation as the adults. What I find most interesting about Fat-Tails, and frankly the most exciting, is the number of new morphs and combos hitting the market every year! The morph potential of these animals alone blows me away. I think they have a very bright future in our industry and will rank in popularity with Ball Pythons. I think the future is very bright for these guys. I think the most difficult aspect of keeping Fatties is breeding. They absolutely cannot be mass produced, which may not be a bad thing. This is the first year I cooled my animals and I’m seeing slightly better breeding, so hopefully by the end of this season I can pinpoint the best methods to breed these guys. Welcome to my obsession. For those of you lucky enough to have worked with these amazing lizards you will understand. For those of you that have not, let me introduce you to the fascinating world of African Fat Tail Geckos (Hemitheconyx caudicinctus). Fat Tail geckos are small, ground dwelling nocturnal geckos that originate in Africa and eat a carnivorous diet of mainly crickets and mealworms. They are typically very docile and slow moving which makes them an ideal handling pet. And with every breeding season new designer morphs are being created which makes the future of working with Fat Tails very exciting. I currently have a large collection of over 70 Fat Tails including Albinos, Caramel Albinos, Ghosts, Oreos, Patternless, White Outs, Zulus and many of the double and triple gene combos in between. My interest in Fat Tails began in 2008 when I was working part-time for a local reptile breeder/wholesaler who had recently received a group of imported Fat Tails. After handling and observing their personalities for a few days I quickly became fascinated with them and started researching their care and requirements. Since I was not interested in purchasing imported geckos, I began searching online for other breeders who were working with CBB and I ended up purchasing my first group of Fat Tails from JMG Reptile. I keep my Fat Tails individually in very basic and easy to maintain rack systems. This allows me to keep a large collection effectively. My adults are kept in ARS Caging 3033 Rack Systems that measure 21.5″ x 15.5″ x 5″ and my hatchling and juveniles are kept in Boaphile Plastics RhinoRaXXs that utilize 6qt Sterilite containers. I use newspaper or paper towels as a substrate and provide a hot spot of 90 degrees 24/7 and a cool zone in the high 70s. This is controlled by using Flexwatt Heat Tape connected to a Spyder Robotics Herpstat. I use Ziploc containers for a humid hide/nest box filled with damp sphagnum moss for my breeders and damp paper towels for my hatchlings. I feed an insect diet of mainly mealworms gut loaded with Professional Reptiles Gutload and dusted with calcium and multivitamins. I also provide an extra calcium dish as well as a water dish. The thing I find most interesting about Fat Tails is their wonderful personalities. I also enjoy all of the new morphs being created each season. My biggest challenge with Fat Tails would be getting them to consistently eat mealworms as their main diet. 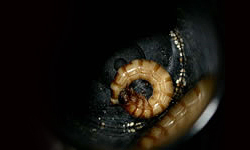 It can be quite tricky and time consuming getting some hatchlings to learn that mealworms are prey items. Once this is achieved I have found that they eat mealworms very well. Monitoring their weight and using proper supplements is very important as well as gut loading your mealworms prior to feeding. I have just recently started offering my adult breeders crickets several times a week as a treat and to help vary their diet. 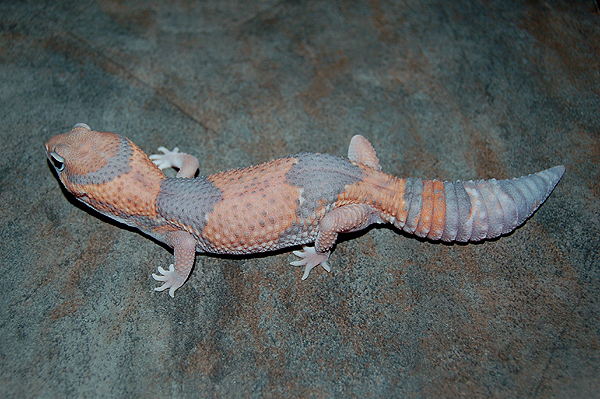 Throughout my career with fat tail geckos, I have bred the following morphs: tangerine normals, amel’s, calico’s/granites, patternless, white outs, oreo’s, batman zeros, caramels and ghosts. I am currently working on producing the caramel zero’s, calico ghosts, and patternless oreos. 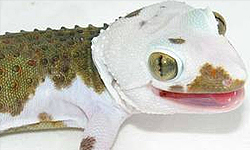 I have always been interested in the habits and breeding of leopard geckos. To learn as much as I could I read numerous books and magazines. I also was lucky enough to have made some good friends over the years who had a great deal of experience and knowledge. What I eventually landed on was this gorgeous photo of the Fat Tail Gecko. Honestly, it captured my eye and at that time all I knew was that they were rare and mostly wild caught. So curiosity got the best of me and the challenge had begun. I went out and got my first Fat Tail from my friend Dr. Richard Funk, a veterinarian that I met who had a similar passion. From that point on, I have been investing all of my time in breeding these amazing reptiles and discovering the world of morphs. Surprisingly enough, my set up for housing and breeding Fat Tails is pretty simple and inexpensive. The adult Fat Tails get housed in sweater box racks and the babies in shoe box racks. To keep it clean and easy I use paper towel substrate, small water bowl and hide box. In the humid nest for breeding I use coco fiber bedding in old butter containers. The heat is provided by Flex Watt tape and the temperature is regulated with thermostats. What I really find interesting with breeding the fat tails are the various patterns I have come across. I am intrigued with the possibilities of all the colors and patterns that can be produced with all the new morphs available. My biggest challenge comes when I am deciding which female to place with which male. The idea is to come up with something new and rare, however with so many possibilities it becomes a game of chance. David Deem owns and operates Shenandoah Reptiles. David is 18 years old and has kept reptiles for a decade. David has been breeding Fat-Tails exclusively for 2 years. He works full time for one of the largest reptile breeders/importers in the world. He is also attending college for business management. Aside from reptiles, David is an avid hunter and fisher. Inspired as a little boy by his Grandfather’s fish tanks, Nick Puppo found himself intrigued with tropical fish. At a young age he got his first job in a pet store. It is here where his passion for fish grew, as well as, his new found fascination for reptiles. What was so intriguing was their diversity. So many colors, species, and habitats. A new passion arose. It was in Southern California that he got a great opportunity to work for Bob Mailoux at the Sandfire Dragon Ranch. This was a chance to work with some of the best. True pioneers of the reptile world. It was here that he worked on the original Hypo Bearded Dragon Project. Working for many years as an East Coast Representative, the next step was to try this for himself. 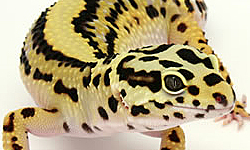 Over fifteen years ago he started “Lecko My Gecko” specializing in high colored leopard geckos, fat tail geckos, and crested geckos. Currently, he is co-owner in F.N. 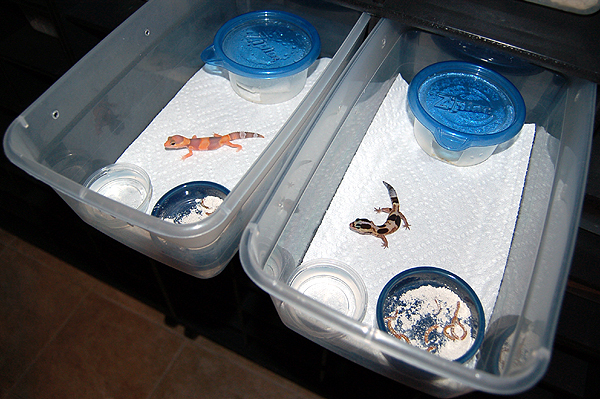 Geckos working with fat tail, leopard, and gargoyle geckos. He has also started to breed a variety of chameleons and frogs. Thanks David, Jessica and Nick for sharing your experience with the African Fat Tail Gecko. Your posts were very informative and helpful. Great write up guys! I love to hear how others keep their fatties happy.